Los Angeles... meter readers gonna GETCHA! The Los Angeles City Council voted (13-0) this week to require the Department of Water and Power to turn over their database to Animal Services about animals noted on private property. Tony Cardenas also asked that the actual number of dogs or horses be included. If you have more than 3 dogs and/or cats, you will be cited for having an unlicensed kennel and forced to get rid of some animals. One councilman wants to pursue cat licensing also. 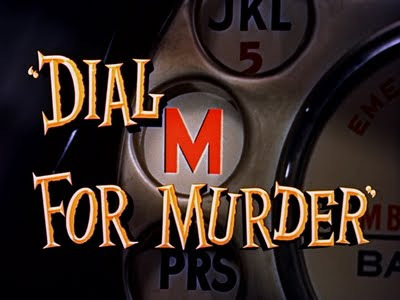 Dial M for Murder....a 1954 Hitchcock thriller. Intrigue and deception abound as a man connives and conspires to murder his unfaithful wife. But that's not like real life, is it? Chilling, callous behavior is the exception, not the rule. For sure, this sort of activity would not be common in the dog world. Politics exists; but heck, no actual physical harm is done as the crawdads climb over each other to reach the top of the bucket. 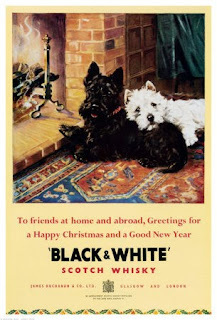 Remember these whisky ads from 50-plus years ago? They graced the pages of most major magazines. There's a natural partnership noted here, and it's not a coincidence. 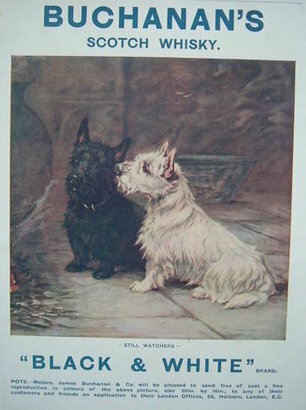 Not too long before the 1890s when this "Black and White" advertising campaign was initiated, these two now-distinct "breeds" were considered varieties of the SAME breed of dog. 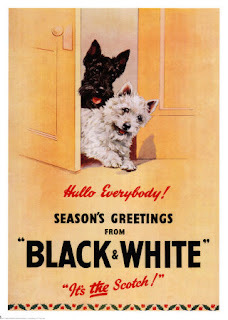 Black, white and sometimes wheaten and even brindle-colored terriers often appeared in the same litter. The BS behind "Designer Dogs"
If you can’t access the link, it’s an ad for Labradoodle puppies, selling for 2700.00 each. Twenty seven hundred dollars!! That’s more than twice the average price of a genuine purebred dog, which, by definition, is “bred from members of a recognized breed, strain, or kind without outbreeding over many generations,” often hundreds, and in some cases, thousands of years. 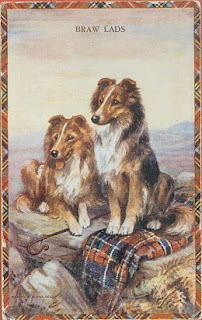 Also known as pedigreed, meaning it has a written, traceable, record of the lineage that proves its purebred status. A Labradoodle, on the other hand, is NOT a purebred. Originally a mix of Poodle and Labrador, its initial claim to fame, that it was hypoallergenic, got great attention and a lot of folks, seeing a way to make a quick buck, jumped on the bandwagon, paired up random Poodles and Labs and sold their offspring as Labradoodles. This led to a rash of so-called “designer dogs,” an endless list of mixes with cute names such as Goldendoodles, Cockapoos, Pomapoos, Bascotties, Buggles, Malorkies, Pithuahuas, Pointsetters, Schnairedales, or the ever popular Jack Russell/Shih Tzu mix, aka the JackShiht. OK, that last one isn’t real (as far as I know), but shows how ridiculous this has become, because, again by definition, each of these dogs is an “animal of mixed breed,” or uncertain ancestry, also known as a crossbreed, half-blood, hybrid, mutt, or, the type of dog most often found in animal shelters. Did I mention those Labradoodles are going for 2700.00? "Parade of Mutants" seen in Westminster BIS ring! "When I watch Crufts, what I see is a parade of mutants. It's some freakish, garish beauty pageant that has nothing, frankly, to do with health and welfare." Last night, during the Westminster Kennel Club Best in Show judging, attendees had to endure an horrific spectacle...an actual, bona fide "parade of mutants". The lanky bodies of the deviants featured raised arms with banners stretched between them. Excessive layers of clothing were required to maintain body warmth. 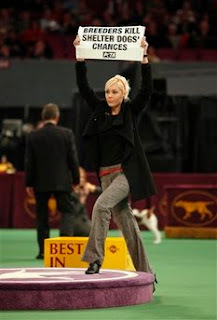 It seems that the AKC premier event had spawned a defective breed...the "PETA terrorist". Ah, sable! The very word evokes images of ladies' mink stoles of yore; plush and rich in color. It's not often these days that we see an actual Real McCoy fur coat; so when it comes to dog coat color we sometimes need to refresh our collective memories a bit in regard to natural coat color and the genetics involved. 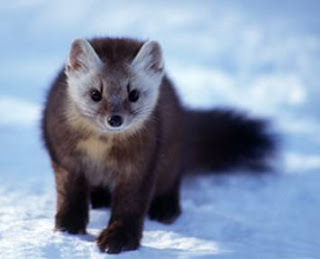 Sable: Coat color produced by black-tipped hairs on a background of silver, gold, gray, fawn, or brown. But a genetic sable may display an appearance very that is very different from this restrictive, limited definition. First, let's back up a bit to the biology of coat color. There are two basic coat pigments. There is "eumelanin" which is your basic black, and the other is phaeomelanin which produces red/yellow. (The prefix "eu" means "true", while "phaeo" is from Greek meaning "color of the twilight sky".) All other coat colors are variation on these two foundation pigments.